عندما تزور ملبورن, ستشعر أنك في بيتك في Easystay Apartments Raglan Street الذي يقدم لك إقامة متميزة و خدمات عظيمة. يقع مركز المدينة المثير على بعد 6 km فقط. يوفر الفندق بفضل موقعة الجيد وصولاً سهلاً إلى أهم معالم المدينة.
. استمتع بالخدمات الراقية والضيافة التي لا مثيل لها بهذا الفندق في ملبورن. يقدم الفندق فرصة للاستمتاع بشريحة واسعة من الخدمات بما فيها: واي فاي في المناطق العامة, صف السيارات, جولات, خدمة غسيل الملابس, خزنة فولاذية . في الفندق غرف نوم يتجاوز عددها 12، كلها مجهزة بعناية وجمال وبعضها مزود بـ تلفزيون بشاشة مسطحة, سجاد, قهوة فورية مجانية, شاي مجاني, بياضات. كما أن مجموعة الخدمات الواسعة الموجودة في الفندق لضمان راحتك تترك لك الكثير من الخيارات لقضاء وقتك أثناء فترة إقامتك. إن Easystay Apartments Raglan Street هو خيارك لخدمة الفنادق الراقية في ملبورن. يُرجى العلم أن عنوان تسجيل الوصول هو 63, Fitzroy Street, St Kilda, 3182. يوجد موقف للسيارت لقاء رسم إضافي و هو أمر خاضع للتوافر. على الضيوف القادمين مع سياراتهم التواصل مع العقار مسبقاً. الحجوزات غير المستردة لا يمكن تحويلها لشخص آخر، ولا يسمح بتغيير اسم النزلاء. The location (St Kilda) may be a good 20 min tram ride from the city. Having said so, there's a tram stop right in front of the hotel. 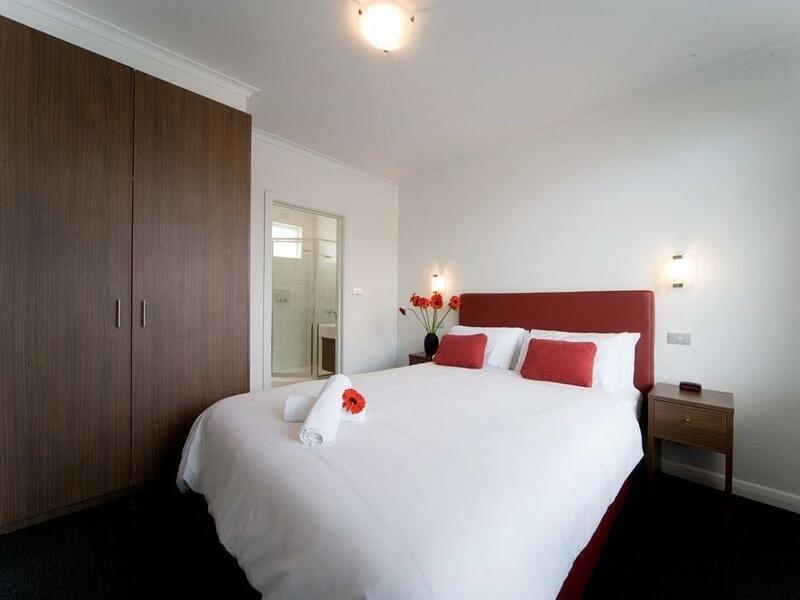 Fantastic for a short stay, equipped with the necessary toiletries and facilities. My parents enjoyed their stay there, they even got upgraded! Will be back. Please check your washer and dryer more regularly. It was a nice apartment. I didnt like that there was no blind on the window and that the blinds where only vanitians so it didnt block out any morning sun. I would not stay here again due to that. But if they had good block out I would consider staying again. Apart from that the apartment was nice and new and clean. Have a great experience staying here. They have complete utensil facilities if you plan to cook in the apartment. The nearest train or tram is 10-15minutes walking. They have washing machine facilities but you need to pay for it. too far away from tram station. at night the street is so quiet and dark. definitely not easy stay - first you check into a shop on the street - and are given a map to raglan street. in the dark and unfamiliar area i was not impressed. parking was on the road by a train line. not close to anything! charge if you did not wash the dishes!! the reception organized a taxi pick up to take up to crown casino. first taxi did not arrive so rang again - after standing in the rain for 10 mins. have stayed all over the world . there were other apartments in acland street which would have been better. did not like being in a location not close to anything. These are budget apartments so I wasn't expecting a much more than a clean room. I was pleasantly surprised at the size of the apartment, there is a full kitchen with everything you need so it's very convenient if you want to prepare breakfast etc in your room yourself. The main bed was quite comfortable, the sofa bed wasn't but was suitable for small kids. 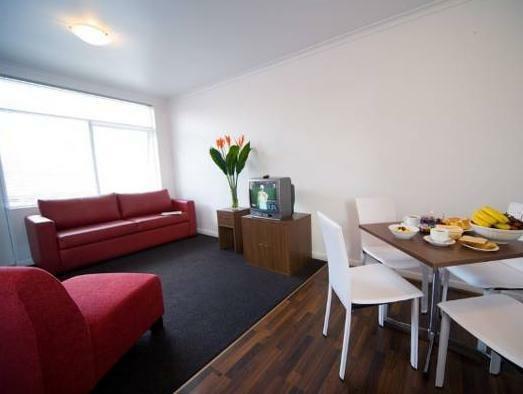 It was very clean and tidy, close to tram stop, short walk to train. Not 'in the middle of it all' but a good spot to access everything from St Kilda beach to Chapel st shopping. We were in a car so getting the key from reception in Fitzroy St wasn't an issue - but I can see how it would be if you were relying on public transport. Lets start with the fact the reception centre was 1 k away from the accomodation, weird set up and impossible to find a park in the area to go in and check in! But after checking in we get a map to direct to our accomodation and we make it to our room. Then the fridge wasn't plugged in, shower looked dirty, in morning when we had to call to check out the phone didn't work! So over all I would not recommend this place to friends or family. Small bathroom but main living area ok. Good location if you have a car. If not, a short walk to Carlise St and restaurants and cafes is great. no services, only cheap prices compare with the nearby apartment.